Venous ectasias of the retromandibular vein are rare lesions that can mimic a parotid mass on imaging. Here we present 2 such cases and, for comparison, a case of mild widening of the retromandibular vein. A combination of multiplanar imaging and astute clinical examination should lead to the correct diagnosis without surgery. 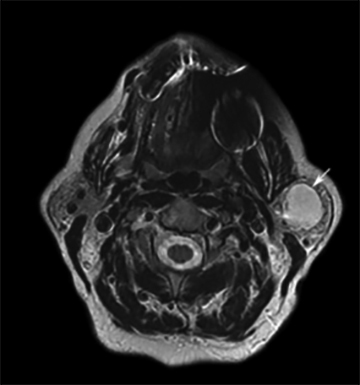 A 69-year-old woman was incidentally noted to have a left parotid mass on a magnetic resonance imaging (MRI) study of the cervical spine. 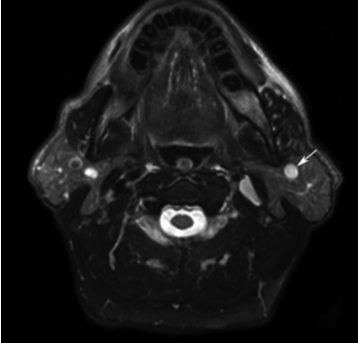 An axial T2-weighted image (Figure 1) from that study showed a well-defined 2-cm left parotid lesion with high signal intensity. Based on the imaging, a diagnosis of a benign or low-grade parotid tumor was suggested, and she was referred to our institution’s head and neck cancer center. A 60-year-old woman initially underwent an ultrasound examination of the lower neck after her primary care physician palpated a neck mass. The ultrasound examination suggested a parathyroid lesion and the patient was referred to our head and neck cancer center, where physicians were unable to palpate a neck mass. A 45-year-old woman had an MRI examination for a thyroid mass. 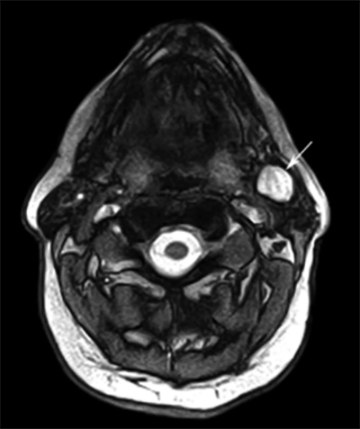 A contrast-enhanced computed tomography (CT) scan again showed a well-defined enhancing left parotid mass. 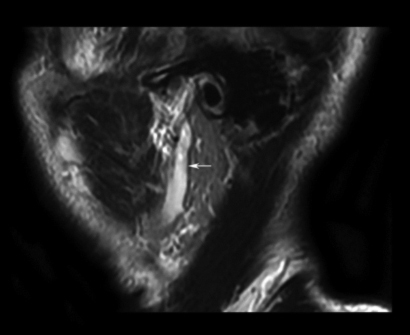 Although the mass was round on the axial images, it appeared to be tubular and inseparable from the lower retromandibular vein on the reformatted sagittal images (Figure 1). When the clinicians were consulted, they said they could not palpate a parotid mass in the erect position, but could detect a parotid fullness with the patient supine. Re-evaluation with an MRI study did not reveal evidence for a parathyroid lesion, but did reveal a left parotid mass. On an axial T2-weightedimage, the mass was well-delineated and had high signal intensity (Figure 2). 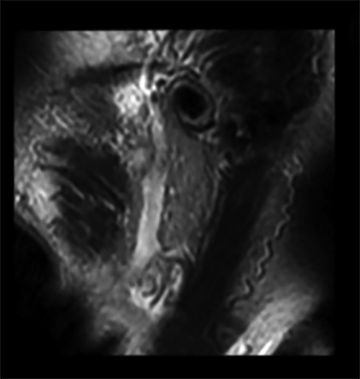 A T1-weighted, fat-suppressed, contrast-enhanced image showed an enhancing lesion in apparent continuity with the adjacent retromandibular vein (Figure 2). 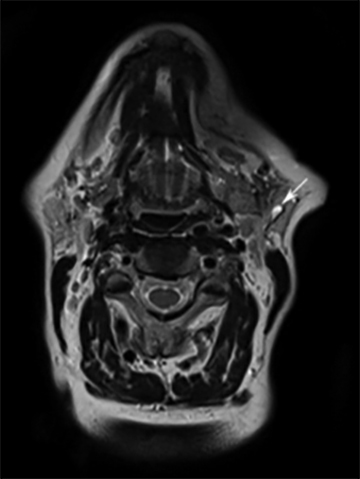 A decision was made to confirm the suspected diagnosis of retromandibular vein ectasia with an MRA and MRV examination of the parotid region. Although there was no interval instrumentation, 5 days later this study showed marked shrinkage of the parotid lesion (Figure 2); however, its relationship to the surrounding vasculature could not be resolved clearly. Similar to Case 1, no mass was clinically palpated with the patient erect, but a parotid fullness was noted when the patient was supine. Incidentally noted on axial, postcontrast,T2-weighted images and sagittal T2-weighted images was moderate, diffuse enlargement of the retromandibular vein (Figure 3). No focal expansion of the vein was noted, and this was considered a normal variant. No mass was clinically palpated with the patient in either the erect or supine position. Had either mass been an aneurysm of the parotid segment of the external carotid artery, it would have been palpable and likely pulsatile.In addition, such an aneurysm would be present in the erect and supine positions and would not be compressible. Similarly, arteriovenousmal formations in the parotid gland are almost always palpable and often pulsatile. The mild diffuse dilatation of the retromandibular vein in Case 3 does not mimic a parotid mass on imaging and is shown to demonstrate the differing imaging appearance relative to the two ectasia cases. Such mild venous enlargement is likely more common than is reported in the literature. Although definitive diagnosis of a retromandibular vein aneurysm has historically been through surgical excision, our examples show that diagnosis need not await surgery. 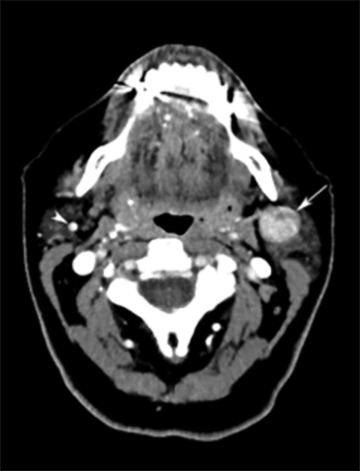 These cases are presented to illustrate how such parotid venous ectasias can mimic a parotid mass on imaging, and how palpation can resolve an erroneous diagnosis of a parotid mass. Azghari A, Belmir H, Kharroubi A, et al. External jugular vein aneurysm: A rare cause of neck swelling. A report of three patients. J Mal Vasc. 2011;36:395-398. Kirmani S, Rashid M, Ali I, Badar F. External jugular vein aneurysm: A rare cause of neck swelling. J Ultrasound Med. 2011;30:1157-1158. McCready RA, Bryant MA, Divelbiss JL, Chess BA. 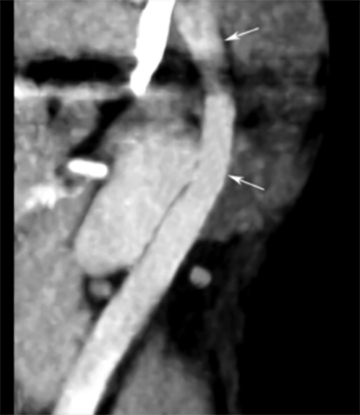 Subclavian venous aneurysm: Case report and review of the literature. J Vasc Surg. 2007;45:1080-1082. Ilica AT, Senturk S, Kertmen M, et al. Facial vein aneurysm associated with sialadenitis. J Clin Ultrasound. 2012;40:319-321. Jensen JL, Reingold IM. Venous aneurysms of the parotid gland. Arch Otolaryngol.1977;103:493-495. Manstein ME, Foote J, Manstein CH, Manstein G. Varix of the facial vein. Ann Plast Surg. 1988;21:155-157. Poyton H, Arora B. Aneurysm of the Facial Vein: Report of a Case. Oral; Surg Oral Med Oral Pathol. 1970;29:390-393. Schulman NH, Carothers A, Gould WJ. Parotid venous ectasia. Am J Otolaryngol. 1981;2:59-61. Strome M. Venous aneurysm of the parotid gland: Case report. Ann Otol Rhinol Laryngol.1970;79:1019-1021. Wadley JK. Aneurysm of the posterior facial vein. Laryngoscope. 1972;82:821-823. Rosenfeld L. Experiences with vascular abnormalities about the parotid gland and upper neck. Arch Surg. 1959;79:553-566. Ioannou CV, Kostas T, Tsetis D, Georgakarakos E, Gionis M, Katsamouris AN. External jugular vein aneurysm: A source of thrombotic complications. Int Angiol. 2010;29:284-285. Radiological Case: Retromandibular vein ectasia. Appl Radiol. Prepared by Dr. Well, Dr. Noor, and Dr. Som while at the Department of Radiology, The Mount Sinai Medical Center, New York, NY, and by Dr. Berman while at the Department of Head and Neck Surgery, North Shore Medical Group, Long Island, NY.